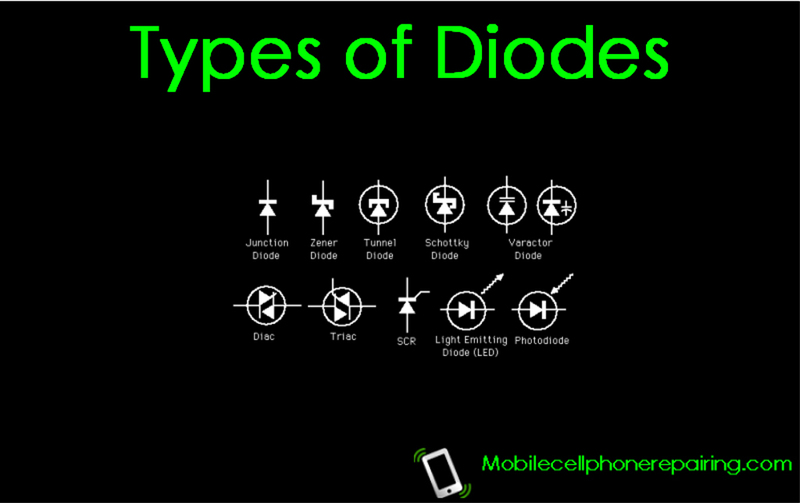 Types of Diode in Mobile Phone and Their Function – Learn about different types of diodes used in a mobile phone and what are their function. A solid state device with two electrodes which passes only the electric current of a particular polarity from one side in called diode. Solid state diode is generally made of germanium or silicon semiconductor. This is used for rectification and switching. Several types of diodes are used in electronic instruments and gadgets. Chip diodes are used in mobile cell phones and other telecommunication devices. These are surface mount devices (SMD). Surface mount devices are soldered with special soldering technique called SMT. Function: Making AC to DC (Converting) and Do the Switching. Components made with the combination of P-Type and N-Type semiconductors are called diode. They are also called P-N Junction Diode. P-type part of the diode is called anode and N-type is called cathode. The point where both these sides combine is called depletion layer because in this section, the electrons and holes remain neutral and do not attract each other. Due to this depletion layer, the electrons from either side cannot unite. When positive supply is given on the anode and negative supply is given to the cathode, it is called forward biasing. This creates HOLE in anode (P-area) of diode and pressure is created on cathode (N-area) because equal charges repel each other. As the pressure continues to increase, resistance of the depletion layer (Junction) decreases to zero and the current flow starts. Supply of negative to anode (P) terminal and positive to cathode (N) terminal is called reverse biasing. As a result, the HOLES of anode of the diode attract the electrons of battery and the positive terminal of the battery attracts the electrons of the cathode and the resistance of depletion layer goes on increasing and stops the flow of current. Mostly AC is used for electrical energy but in some cases DC has to be used. The process of conversion of AC to DC is called rectification. This type of diode is used for detecting signals. These diodes are made of glass. A red ring on the terminal marks its cathode. These diodes are available in following numbers – IN4 148, IN34, OA79 etc. SMD signal diode is also available in black color. This is a special type of diode made with silicon which is used to keep the output supply stable. Zener diodes are used to stabilize voltage. Zener diode is represented by “Z”. Zener diode is recognized by its “Zener Volt” like 3.0VZ, 3.9VZ, 5.1VZ, 6.2VZ etc. This is a variable capacitance diode which functions on the principle of variable capacitor. These diodes function within a defined range of capacity. Varacter diodes are available in the values ranging from 1 to 500 pf and 10 to 100 V. These are used in the signal transmission circuits. These diodes are used for processing the properties of negative resistance and are used for switching at microwave frequency level. What is LED or Light Emitting Diode? These are diodes that produce light after receiving forward biasing. They are used to light the display or keypad in mobile phone. ” My people perish because of the lack of knowledge” Santosh Das! You are truly the best! Nobody can dispute that fact! Wow what an explanation! Bomb! WORDS CAN NOT EXPRESS HOW GREATEFUL I AM.THANK YOU FOR THIS ARTICLE. I WISH TO CONTACT YOU PERSONALLY. I love reading these articles because they’re short but inotemafivr. Ive been searching for a well -explained and easy to understand stuff just like youve sone on mobile phone components and functions and I must confess that im truly grateful for a work well done. Keep up the good work bro.Well done.Youre a good man.Wish I could contact you personally. I came across this link while am searching for certain tips on mobile phone repairing,and with what i have discovered in your blog i ll say that you are a blessing to us beginer on phone repairing and i pray that the lord almighty shall increase your knowledge AMEN.